I culture milk kefir and viili yogurt from Cultures for Health at least weekly. I typically use either a pint jar or a glass jars from peaches that has the same foot print but is several inches taller. Both of these ferments culture at room temperature, which makes them very easy to do, but sometimes in the middle of winter my kitchen gets a little cold when the stove isn't on (60's, instead of 70's). 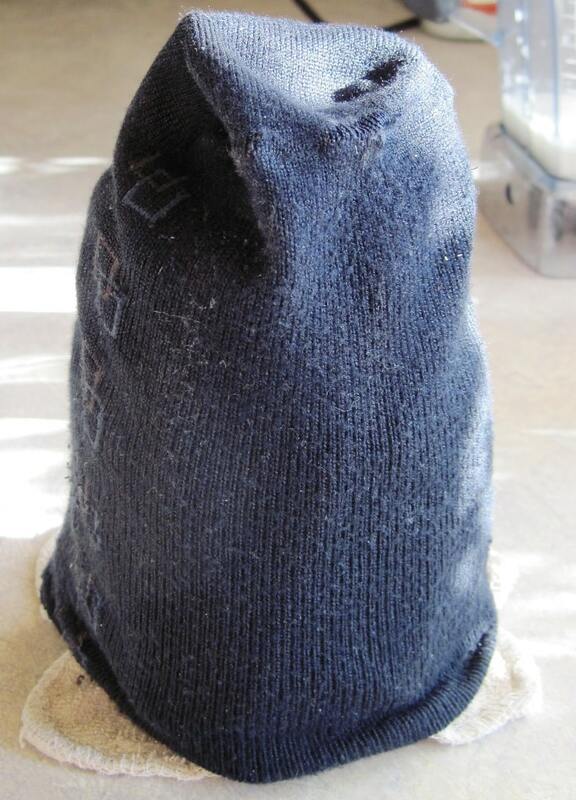 So, to give my starters a little extra help, I employ the “magic fermenting sock”. First, a quick background on milk kefir and viili yogurt. 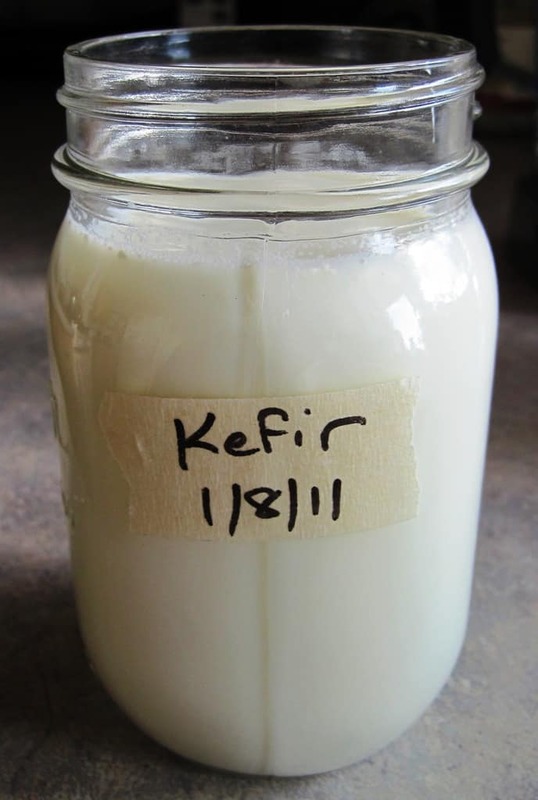 To make the kefir, take your live kefir grains and mix them into a fresh batch of milk. For the yogurt, simply take a tablespoon or two of yogurt from a previous batch and mix it into fresh milk. That's it. Once I've got the starter (be it grains or yogurt) in the milk, I cover it with a clean cloth and rubber band. Then, I cover it again with the “magic fermenting sock”, which is really just an old mismatched dress sock of my husband's, with about half of it cut off (no, I don't throw hardly anything out if I think I can use it again). 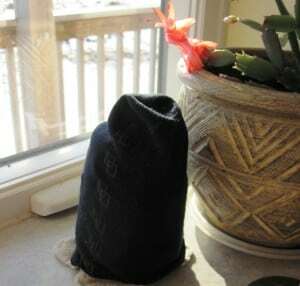 You want to make sure that the sock covers the jar completely, as exposing your ferment to direct sunlight is a no-no. (Direct sunlight exposure sanitizes and kills microbes – great for laundry, not good for living foods.) I think it looks a bit like Cousin It from the Addams Family. Place the jar in a sunny window (mine lives near my sink and the Christmas cactus). 18 to 24 hours later and your kefir or yogurt is ready. I wouldn't do this in summer, as you might cook and kill your culture, but in the winter it gives a nice little kick start. When your ferment is ready, place a lid on the jar and refrigerate. I normally use my kefir and yogurt in smoothies, or just mix some fruit or jam in (plus some goes to the kittens), but Donna over at Cultured Food Life has a lot of creative recipes. Featured at Simple Lives Thursday. This post is exactly what I've been looking for – I avoid making yogurt because it can be such a pain trying to keep just the right temp, etc. I will give your sock-method a try! Thank you so much for posting this how-to! I found you through Monday Mania, by the way. Why not use a thermos flask for making yoghurt? Yoghurt really benefits from having a steady temperature (may keffir too?). You will get much more predictable results. Also, cute though the sock is, if the culture has cooled down, the sock won’t get it up to optimum temperature – it will just keep it cold. I'm learning so much from you when it comes to fermenting and everything else you do..Thanks for sharing. Danielle – I avoided yogurt for years because of the temperature requirements of standard cultures. When I read about the viili yogurt on CFH, and how it ferments at room temp, I thought, "I can do that! I had been using the dress socks to cover my herbs in glass jars to block out excess light. We have both active and passive solar heating for the house, so the solar culturing was a natural fit. Definitely Cousin IT, no doubt about IT! (pun intended)Would have recognized him anywhere. Viili, water kefir grains, sourdough are on my list of next to order from Cultures for Health. My Kefir grain rehydrating is going great. Really looking forward to the growth of the grains. I've actually been culturing yogurt on the counter for quite sometime just with yogurt I made from the powdered yogurmet culture. I stopped using the heated yogurt maker method after I heard from my sister how her mother in law has done it the old Finnish way for years. So one day I literally just dumped probably around 2 cups + or – into almost a gallon of my grass fed raw milk. Covered, let stand out for 24 + hours. Best tasting yogurt ever. But I do want to get the real viili culture. P.S. this might be the 2nd comment, discard the first…if you got it. I don't know what key I hit before sending, vanished. Emily – I don't know about other yogurt cultures, as I've only tried the viili, but according to Pamela (and she's a pretty smart cookie ;-), it should work. Also, I don't currently have access to raw milk (it is currently illegal in WI), so my milk is pasteurized. I have seen some blog post suggesting that cultures may weaken over time if you use raw milk. You could try asking Julie at Cultures for Health directly (there's a link on the sidebar). I'd try it with a small batch and see how it turns out. Emily….I started out making yogurt using yogurmet' powdered culture in raw milk. I did not follow the directions on the box. I took about 2 cups milk from a gallown of milk and I think it was 4 pkgs. of powder. Heated the milk just till warmed up. Removed from heat, stirred in the powder then poured it all back into the gallon jar. 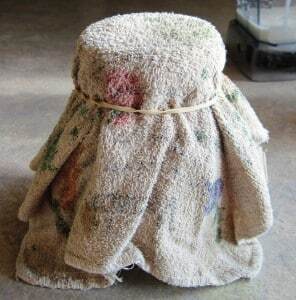 Covered with a cloth or loose cover and let it sit for 24 – 48 hours – just watch for thickening. From then on all I have done is save out 2 cups yogurt from the finished batch, pour it directly into a new gallon jar full of raw milk that has 2 cups removed. Give it a stir, cover and let culture. I've haven't encountered a weakening of the yogurt cultures at all. Although right now I would need to start all over because the last batch I did I forgot to save out yogurt…LOL..ate it all up with out giving one thought to it. Like I told Laurie I want to purchase the viili from Cultures for Health. My sisters mother in law I mentioned above started her yogurt out the old Finnish way with just plain old yogurt from the store like Dannon years ago because she didn't have a viili culture. But she's never used a heater of any sort. Just a suggestion but I use the same method for keeping the temp stable in both summer and winter and that is using an insulated cold beverage cooler. I have a 2 gallon one that I use to make yougurt from one gallon of milk and 1 6oz tub of storebought plain live culture yogurt. Yogurt needs air room in a container to culture properly so a full container would not have enough oxygen. I heat my milk in my crockpot since cleanup is so easy and there is no worry of scorching it. It takes about 2 hours to reach 160 degrees, then I allow it to cool down to 115 degrees, stir in the live culture yogurt with a whisk and then put it in the cooler to ferment. I get high yields this way with very little whey to drain off. to drain it, I use a cotton lint free dish cloth to line a colander and suspend it over a large pan or bowl and fill it up with the loose yogurt and allow the whey to drain out. You can leave it draining until it becomes cream cheese consistency if you want it that thick. I made some cozies by crocheting a flat circle a tad smaller than the jar, and then crocheted even around until the jar was covered. I use them for my water, since I drink it out of a canning jar. I’ll be making some for my dehydrated foods now. Thank you for the idea!